you know that spot of your home, or room where it's just a little bare and when you walk past it you always think - i really need to find some art to go there. well... if you're into modern art then i've got the perfect idea for you and you can totally do it yourself. let your inner artist out and also release a little frustration out too while you're at it - art really can be therapy. this really couldn't be any easier, get creative with how you apply your paint to your canvas - throw it, pour it from a metre above, dip your fingers in paint and flick it heck squeeze it straight from the tube. the best thing about this art is that there are no rules, and everyone's piece will be completely unique. don't be threatened by this project, i promise you'll love it and before you know it's kind of addictive to create because each piece is so original. what makes this even easier is you can grab literally everything you need for this project from your local spotlight. you will need. 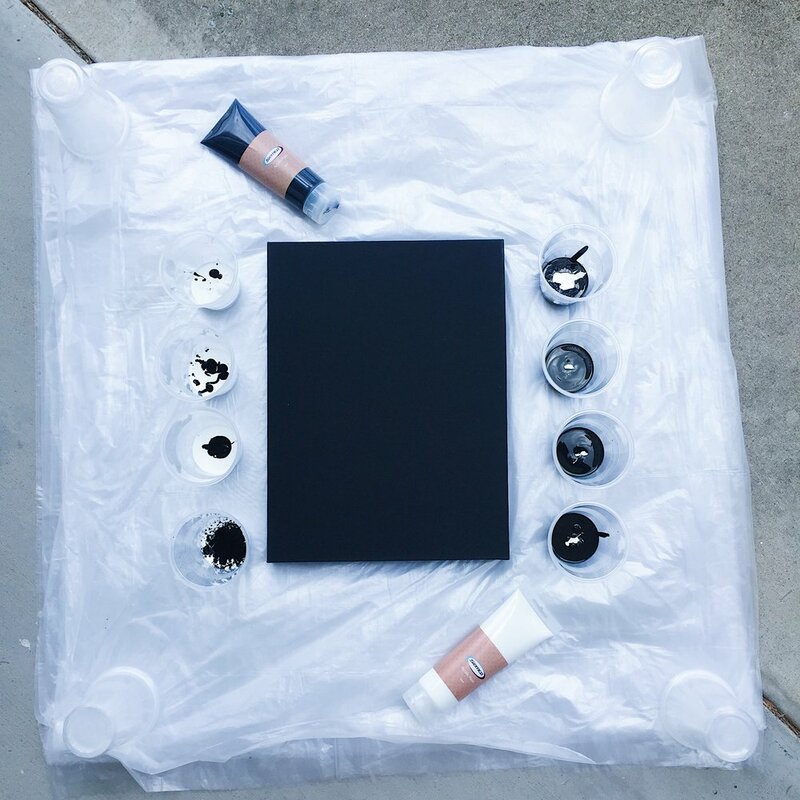 a canvas, black and white acrylic paint, disposable cups, drop cloth and a paddle-pop stick or disposable knife. step one. lay down your drop cloth so that it extends at least 50cm away from the canvas on all sides. step two. mix your desired amount of shades into your disposable cups, use a paddle-pop stick of disposable knife to stir each colour starting with your lightest shade so you don't have to clean your stirrer after each one. step three. get creative with your paint application - splash, flick, drizzle, throw, splatter *insert more adjectives here* to create your desired look. step four. leave your canvas to dry, depending on your climate and how thick the paint is in places this may take up to a week. step five. display/style your new artwork with pride - you made it and no one can ever re create it exactly as you have, it's truly an original artwork. if you want the print you see styled with my artwork you can grab it below, when you print it just adjust the scale so that the words are proportionate to your desired frame. ever thrown paint at something to release your frustration? are you a fan of modern art? tell me all of the things in the comments below.